In conjunction with the exhibition, The Artists Who Came in from the Cold at Kunzarchive & Projects, opening May 23rd 6pm, the photographer Allen Frame will offer a three-night intensive workshop in photography for intermediate to advanced students. This brief, intensive course will help students find or deepen a subject in photography that can be developed with depth and complexity into a consistent and extended body of work. Exercises with memory will uncover interests, preoccupations, and connections to current circumstances that may help identify a worthy direction. Emphasis will be placed on choosing the right subject or material, then analysing that choice for its relevance and meaning. Any subject will be welcome as long as the photographer can be convincingly engaged with it. References will be made to contemporary photography, as well as to examples from the history of photography, art, and film. This short workshop will focus on the ideas for a project, not the production itself, which would take much more time to unfold. Allen Frame is represented by Gitterman Gallery in New York where he has had solo exhibitions of photography in 2005, 2009, and 2013. His 2013 exhibition Dialogue with Bolaño was presented at the Museum of Art of the Sonora in Hermosillo, Mexico, in 2014. He has also had solo shows in Paris (Galerie Polaris), Budapest (Liget Galeria), and Zurich (Schedler Galerie). His work has been included extensively in group shows since 1976. Detour, a compilation of his photographs over a decade, was published by Kehrer Verlag Heidelberg in 2001. With Nan Goldin and Frank Franca in 1990, he co-created Electric Blanket, an epic slide show about AIDS, which toured throughout the U.S. and to Norway, the U.K., Germany, Hungary, Japan, and Russia. That project will be presented in a group show by Lower Manhattan Cultural Council at Governor’s Island in May, 2015, about public art and performances in New York in the 1980’s and 90’s. He co-founded the contemporary art center Delta Axis in Memphis in 1992. He has curated numerous exhibitions for contemporary not-for-profit spaces, including Art in General, (Darrel Ellis in 1996 and In This Place in 2004); PS122 Gallery, (Bearings: the Female Figure in 2006); and at the Camera Club of New York, (Linda Salerno: A Selection of Experimental Photographs from the Black Mirror Series and Anatomy, Persona, and the Moment: 70’s Experimental Photographs of Luigi Di Sarro). He currently serves on the Board of the Camera Club of New York, and he was an Executive Producer of Joshua Sanchez’s feature film Four, released in 2013. He has been the recipient of grants from the Penny McCall Foundation, the Peter Reed Foundation, Creative Time, Art Matters, CECArtslink and others. He is an Adjunct Professor of Photography at Pratt Institute (MFA), the School of Visual Arts (BFA), and the International Center of Photography. He also writes about art and photography and recently has written about Benjamin Fredrickson, Igael Shemtov, and Mariette Pathy Allen. He is writing a memoir about the Boston photography scene in the 1970’s, with photos drawn from his archive, and he is completing a full-length play called Dogs Barking in the Deep South. Born in Mississippi in 1951, he grew up in the Delta town of Greenville, known for its literary culture and progressive Pulitzer Prize-winning newspaper. Shelby Foote and Walker Percy had gone to his high school and Southern writers like William Faulkner, Carson McCullers, and Tennessee Williams were strong influences on him. His photographs from Detour have been used on the covers of 9 books by Roberto Bolaño. After graduating from Harvard University in 1974, Frame moved to New York in 1977. 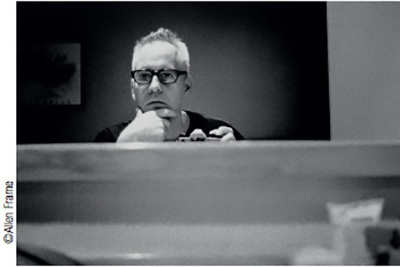 During the early 1980s, Frame, already a photographer, was also part of an experimental theater scene, working with Bill Rice, Sue Williams, Gary Indiana, Taylor Mead, Frank Franca, Rosemany Moore, Suzanne Fletcher, Butch Walker, and Steve Buscemi, and directing a play based on the writings of David Wojnarowicz.